We live in a world full of great entertainment. Watching movies or videos is a good source of feeling entertained. Sometimes, we go to cinema to enjoy the latest-released movies. Sometimes, we stay at home to enjoy the classical DVD movies. Sometimes, we watch videos directly and conveniently on our portable mobile devices. Modern people spend a lot of time and energy on their portable electronic gadgets. It is very common for us to see countless people watching videos on their tablets or mobile phones when taking a bus or subway, however, there is an undeniable fact that portable devices support only few of video formats such as the like of MP4 format. At present, we still cannot play Blu-ray or DVD movies on portable devices. We need to convert Blu-ray or DVD into other video formats compatible with portable devices first, which can only be achieved by video converter. In the following article, top 10 free video converters will be introduced. Please take a deeper look. 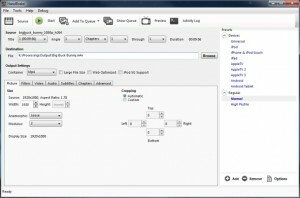 HandBrake is a free video file converter and transcoder for converting video from nearly any format to a selection of modern, widely supported codecs. Being an open source video converter tool, it supports multi-platform (Windows, Mac and Linux) and countless output devices like iPad, iPhone, iPod, Apple TV, Android mobile phone, Android Tablet, etc. Just like its name “Freemake”, Freemake Video converter, on one hand, is free of charge, on the other, enable users to free convert video and make their desired video formats. Freemake does its converting job well by converting videos from one format to another quickly and easily, and it is extremely versatile for it can even turn 1080P video into different formats. 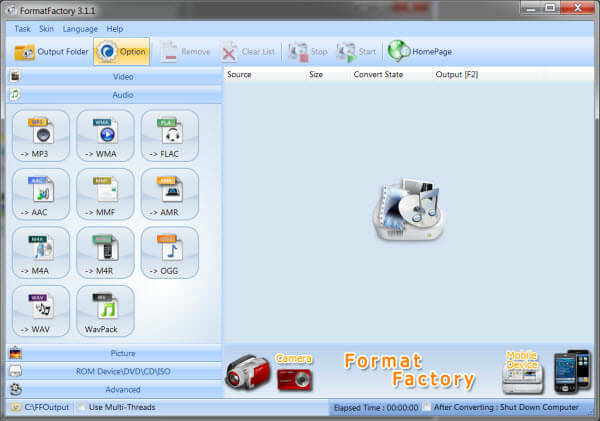 Format Factory is a free yet multifunctional converter software that’s able to convert all types of video, audio and image files. Complete, powerful and free, it’s an easy-to-use conversion tool. MPEG Streamclip allows you to play, edit and convert most of the movie formats that include the MPEG files. Although built with an editor inside, the editing feature is relatively limited, only simple editing in terms of Cut, Copy, Paste, and Trimming clips available. The main feature of MPEG Streamclip is to convert MPEG video to multiple video formats. Leawo Video Converter Ultimate is a video converter suite that integrates Blu-ray Ripper, Blu-ray Creator, DVD Converter, DVD Burner, Video Converter and Video Downloader into a single one program thanks to Leawo Software’s advanced technology. It can convert all video/Blu-ray/DVD files to video in various popular formats, burn videos into Blu-ray or DVD files, download online videos from videos-sharing website. MPEG Streamclip is limited to Windows platform only, which means it doesn’t support Mac OS. Though platform limited, AVS video converter is a powerful converting tool able to convert all key video formats including HD video, AVI, MP4, WMV, Blu-ray, DVD, etc. The converter is preset to support a wide range of devices such as iPhone, iPad, iPod Touch, Samsung, Android tablets, Sony PSP, Amazon Kindle, smartphones, portable media players, etc. Inspired by the MPEG video standards group, added the concept of “Fast Forward”,FFmpeg is therefore created to record, convert and stream audio and video between popular formats. Designed to fit different operating systems, FFmpeg can be run across Linux, Mac OS X and Microsoft Windows. 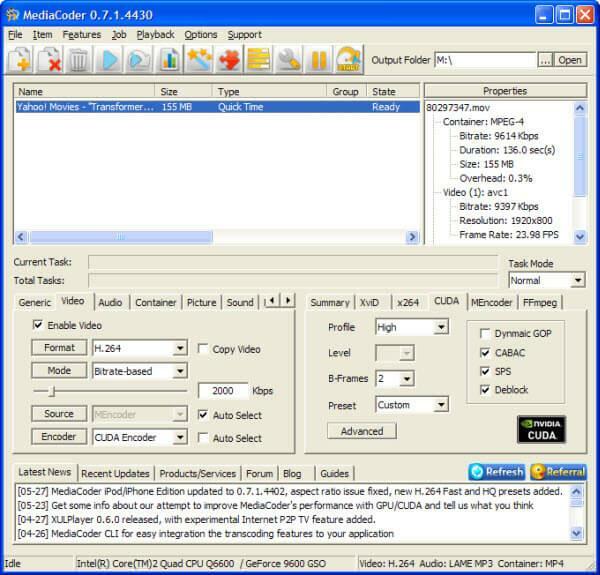 MediaCoder is a piece of free media transcoding software, putting together most cutting-edge audio/video technologies into a transcoding solution with a rich set of adjustable parameters which let you take full control of your transcoding. The output video formats supported are MP4, WebM, F4V, FLV, Matroska, AVI, MPEG-PS, MPEG-TS, ASF, MTS/M2TS/AVCHD, Quicktime/MOV, PMP, RealMedia and OGM. 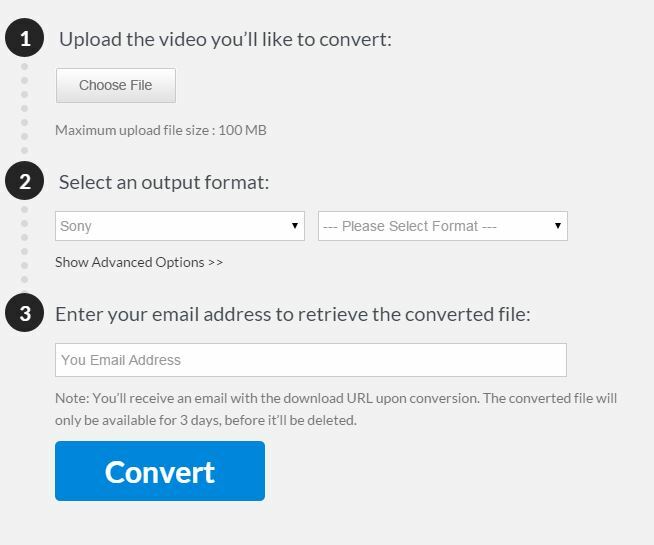 Free Online Video Converter helps you to convert media files from one format into the other format. It supports many video formats including DVD files, ISO files, MP4, AVI, MKV, VOB, etc. Also, it can directly set output devices such as Apple devices, Samsung devices, Sony devices, etc. But there is a limitation on the input file “the file uploaded should be less than 100MB”. With Koyote Free Video Converter you can easily convert videos to a variety of formats, including those suitable for portable devices. Koyote Free Video Converter can convert input videos in AVI, DIVX, MOV, MP4, FLV, 3GP, WMV, ASF, MKV, VOB, MPEG, MPG, M1V formats into videos in 3G2, 3GP, ASF, MP3, AVI, DVD, FLV, MP4 (iPod, iPhone, PSP, Zune), MPEG1, MPEG2, WMV output formats. If you have to single out the best free video converter among those top 10, Leawo Video Converter Ultimate is the most powerful one. 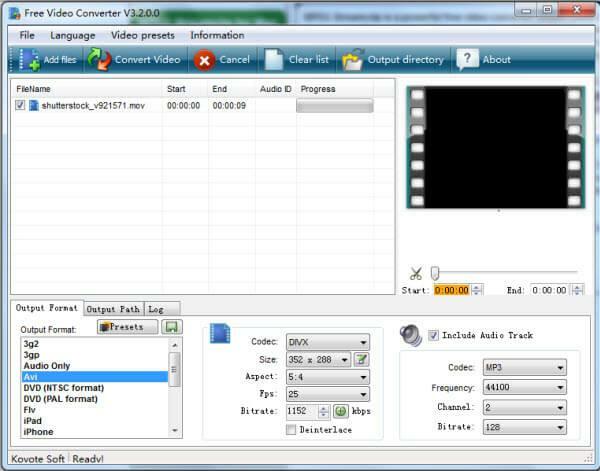 It offers free trail version, therefore to some extent, it can be regarded as a free video converter. Besides, it has two versions available: Leawo Video Converter Ultimate – free video converter for Windows, and Leawo Video Converter Ultimate for Mac – free video converter for Mac. In addition to the features mentioned above, it possesses other features that will definitely grab your whole attention. Why is Leawo Video Converter Ultimate the most professional and the best video converter? Professionally convert HD videos to SD videos, extract audio off HD/SD videos to save in various formats like MKV, WMV, MP4, AVI, FLV, 3GP, MP3, etc. for multiple players and devices like iPhone, iPad, iPod, Android tablets and phones, Windows phones, etc. Convert HD Blu-ray movies to 1080P/720P HD videos in various HD formats like HD AVI, HD MP4, HD TS, HD MPEG, HD MOV, HD VOB, HD WMV, etc., making you have the best Blu-ray movies enjoyment. For advanced purpose, you can adjust video and audio parameters such as video codec, audio codec, video size, bit rate, sample rate, aspect ratio, frame rate, etc. You can use the best free video converter software to convert video and audio file from one format to the other.